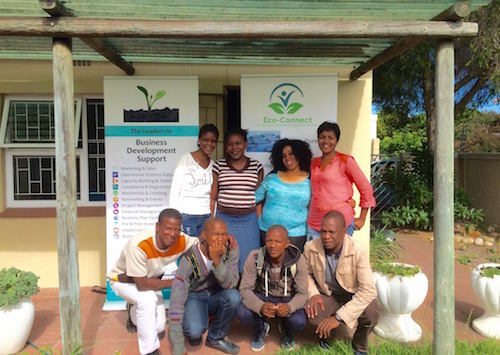 Eco Connect is a non-profit pre-incubation program that helps township aspiring entrepreneurs start green businesses. So if you have some spare time and want to share your expertise, that would be so much appreciated by this new organisation. The initiative operates an 8-month programme for local aspiring business people and has just started it's first intake of young South African entrepreneurs at their newly opened business and training centre in Claremont/Cape Town. The founders of this amazing initiative are currently looking for volunteer mentors such as established entrepreneurs or managers who would like to share their experience of leading a business with motivated youth from the townships. Young locals are given the opportunities to learn new skills, explore new routes and develop their communities. The range of participants is wide with 'students' coming from rural areas where they never had an opportunity to grow their talents or from townships where living conditions and schooling and social opportunities were extremely poor. Mentors can volunteer for a once-off "inspiring talk" at the training centre in Claremont, or for monthly follow-ups and pro-bono consulting with one of the participants. Eco-Connect is joint initiative of Comptoir de l'Innovation which is a member of Groupe SOS, the largest French social enterprise with 1+ million beneficiaries. Group SOS partners with SA Business Resources Institute in this project. Their offices in Cape Town are located at 31 Garfield Road in Cape Town. Feel free to contact Shayna at sabri dot co dot za for more info.